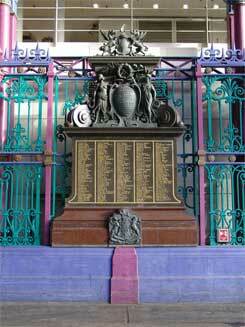 This is a granite and bronze memorial erected in 1922, having been paid for by butcher tenants of the Smithfield meat market, to commemorate the meat market workers who lost their lives in the First World War. The memorial stands on Grand Avenue, the street which divides Sir Horace Jones's 1866 central market building. 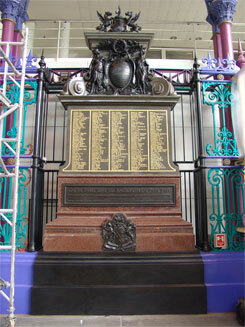 The memorial required conservation, including cleaning, patination and waxing of the bronze elements, and significant alterations were made in order to incorporate a new plaque which we cast (shown below) dedicating the memorial 'to the memory of all men, women and children of Smithfield who lost their lives in conflict since the Great War'. A new block of granite was cut and inserted to take the new plaque, and a new base was cast in bronze to form the base part of the whole memorial. The railings immediately surrounding the memorial were altered to a more fitting design and painted black to provide a more suitable setting. The memorial was then re-dedicated by Her Royal Highness the Princess Royal, in June 2005.